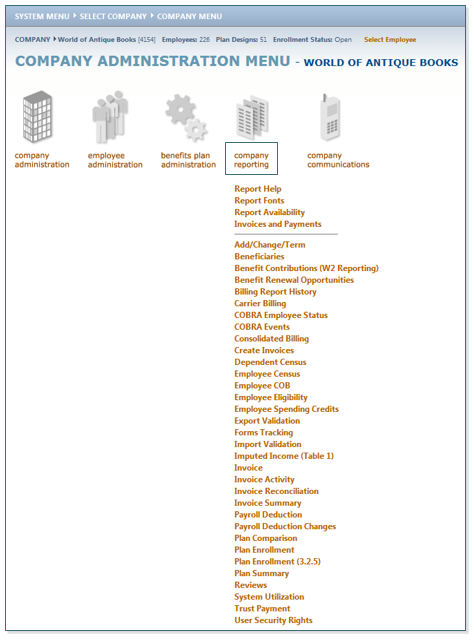 benefitsCONNECT® offers a variety of standard reports to help you manage your benefits administration. These reports can be accessed either at the System Level or at the Company Level. When you run reports from the Company Reporting Menu, you are able to capture more specific details. For example, if you run the Employee Census report from the Company Menu, you can select specific divisions and employment categories within that company. Running the same report from the System Menu does not allow that level of detail. Click on Company Reporting. Each available report is listed. To run the reports, click on the report name. You will be taken to the page where you can specify the report selection criteria (this page is referred to as Report Pick Page). After you selected the criteria, you can run the report. PLEASE NOTE: Due to the large number and complexity of available reports, please contact your Broker or Account Manager for assistance in how to generate specific reports. If you have the need for any regular, periodic reports, these can be set up to run automatically on specific day(s) and sent to you via secure email.